- green icon with a plus sign – allows You to quickly add new photos and videos to Your album. Additional albums – “Bookmarks”, “Mail Attachments”, “FTP” and “Print history” are now located at the bottom of the page. 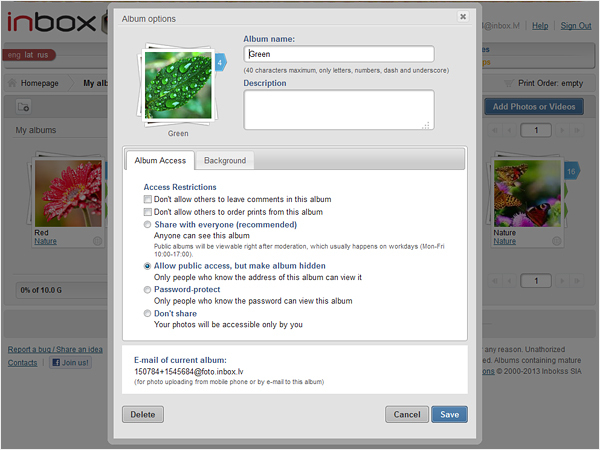 Link to the album access level now leads to a page with all the settings of the album, including: the name and description of the album, access control, background change, album deletion. You can also view e-mail address of the selected album, which is used to quickly add new photos via e-mail to this album. 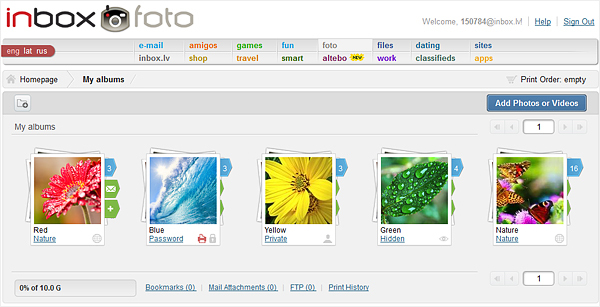 Additional control panel for working with photos in the album was introduced. All the basic functionality is now grouped into two new menu items: “Edit” and “Options”. Option to change the album cover by choosing the photo and selecting the check box titled “Set as cover” in the “Edit” section. Following icons were moved in the upper left corner: “Slide Show”, “Send album to a friends”, “Send to Print”. At the bottom of the page, You can change the sort order of photos in an album, or use the manual sorting in the “Options” menu. Public categories’ section has a new separate page now. (http://foto.inbox.lv/controller/category). You can access the category via link provided at the top of every public picture. As before, Inbox Foto offers editing tools for experienced and novice photographers, fast printing of photos, use of effects, as well as 10 GB of free space to store video and photos.